Federated Environmental offers comprehensive asbestos inspection, testing, and abatement services. Each technical staff member assigned to an asbestos project possesses certification such as an AHERA Asbestos Inspector and Management Planner. In addition, asbestos abatement projects are managed by personnel that possess the needed asbestos abatement, abatement oversight, and project design certifications. 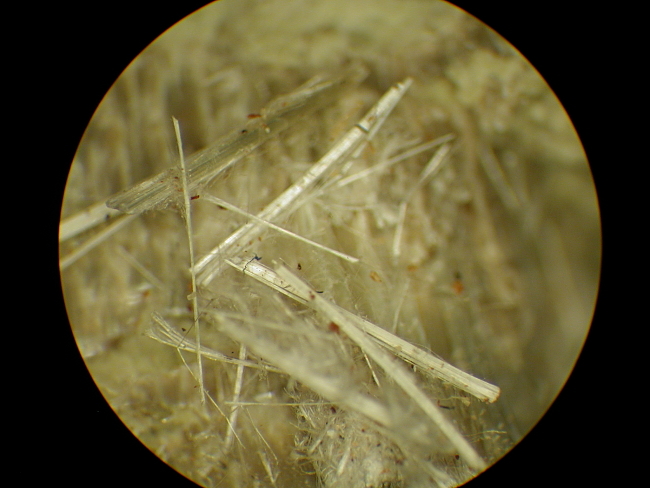 Chrysotile asbestos, 10X stereoscopic view. An Asbestos Operations & Maintenance Plan (O&M Plan) is a binder for building managers that contains both a Comprehensive Asbestos Survey and ongoing notes describing how identified asbestos-containing materials (ACMs) are being managed in place. Asbestos is a naturally occurring mineral that has been used in a wide variety of building construction materials and in other applications. Unlike many other kinds of minerals, asbestos forms fire-resistant fibers that can withstand great temperatures. In addition, because of its unique fiber structure, asbestos fibers can be woven into cloth, and also can be used as filter material. Millions of tons of processed asbestos have been used in building materials such as structural steel fire-proofing, wall board, floor tiling, grout, textured wall/ceiling applications, ceiling tiles, insulation, theater curtains, gaskets, and other materials. In addition, asbestos has been used in other applications including automobile/truck clutches and brakes. The greatest risks posed by asbestos and asbestos-containing material (ACBM) include lung cancer, asbestosis, and mesothelioma. These health conditions are associated with the inhalation of asbestos fibers which lodge in the body’s lung tissues. Once in place, the asbestos fibers cause a variety of deleterious health effects. Because of these health effects, asbestos is highly regulated at both the federal and state levels. In, addition, ACBM’s are subject to specific removal or management requirements (abatement). Federated Environmental has extensive experience nationally with asbestos inspection, management, and abatement projects. Federated Environmental’s asbestos-related services include Asbestos Hazard Assessments, Operations & Maintenance Planning, Asbestos Abatement Specifications Development, Oversight, and Monitoring, and Asbestos Clearance Testing. These provided services will greatly reduce or eliminate the health risks and liability issues associated with the material. Federated Environmental is commonly contacted to perform quick turnaround assessments of material at demolition and construction sites to determine if a hazard exists. Under these circumstances an AHERA accredited Asbestos Inspector will visit the site, take representative samples, and have the samples analyzed for asbestos content. Federated Environmental will provide a written report to the client explaining the results of the inspection and testing with recommendations on how best to manage the material. An AHERA accredited Asbestos Inspector will perform a visual survey of the building for suspect ACBM materials. During the visual inspection, representative samples will be taken. Suspect materials and areas will be inspected as to their accessibility, quantity, condition, and potential for damage. The collected samples are properly labeled, recorded on a Chain of Custody manifest, and delivered to a laboratory accredited under NVLAP (National Voluntary Laboratory Accreditation Program) for analysis using polarized light microscopy (EPA Method 600/M4-82-020). Federated Environmental will provide a complete report of findings that can be used to obtain abatement quotations or other information. In addition, Federated Environmental will provide the client with an explanation of the potential risks and concerns from a regulatory perspective. Under certain circumstances, ACBM does not represent a significant environmental risk in its present location and condition. However, controls must be instituted to ensure that the ACBM is not disturbed or damaged, causing an unnecessary release of fibers. Federated Environmental can develop a site-specific Operations and Management Plan which describes the location and condition of the material, and how the material should be managed during routine maintenance and repair activities. An Operations & Maintenance Plan establishes a guideline for on-site property managers to use in order to reduce exposure risks. In addition, it provides a level of comfort that ACBM is being properly managed on a day-to-day basis. The calculation of costs for the asbestos abatement strategies including removal, encapsulation, encasement, and enclosure. The development of the actual specifications that detail how the abatement process is to be completed. The development of an interim Operations & Maintenance Plan until the abatement process can be implemented. Coordination of the abatement activities and the development of an construction phase monitoring plan. Federated Environmental can offer the client services in all of these areas to ensure that the asbestos abatement project is managed in a cost-effective, responsible, and risk-reducing manner. A reinspection of the property to ensure that the abatement was completed according to the developed specifications plan. The reinspection is also designed to cover the proper clean-up of ACBM, abatement materials signage. The review of air clearance testing. On larger permitted asbestos abatement (removal) projects, there may be no more than 0.01 fibers per cubic meter centimeter of air. The best quality assurance method of air clearance testing include 5 samples inside the building or project, 5 samples outside the building or project, 2 field blanks, and 1 sealed blank. A review of the ACBM disposal documentation, if the abatement strategy included material removal. Federal and state regulations require that friable ACBM be disposed of at a facility specifically permitted to receive the material. Evaluate how your environmental professional and consulting company manages their own potential environmental risks and liabilities. If they are unconcerned about their own liabilities, they can’t be expected to care about yours either. Be certain that your environmental professional provides to you a Certificate of Insurance that documents professional liability coverage.